It is a cancer that starts from the early version of white blood cells called lymphocytes in the bone marrow. Leukemia cells usually invade the blood fairly quickly. They can then spread to other parts of the body, including the lymph nodes, liver, spleen, central nervous system (brain and spinal cord) if not treated at an early stage. 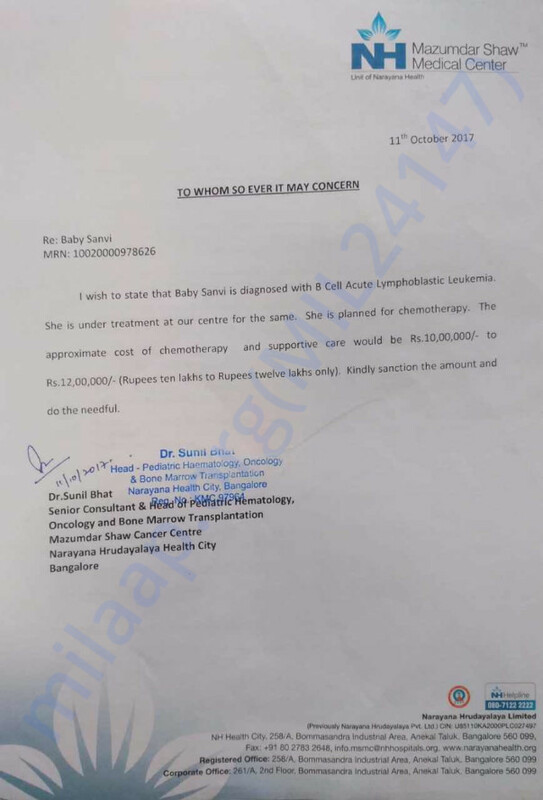 Sanvi was advised to begin chemotherapy treatment at the earliest and she needs to undergo numerous chemo sessions and treatment in order to fight the cancer. The total cost of the treatment is around 12 lakh Rs. Unfortunately, Santhosh does not have the funds to pay for her treatment and is worried that without the money he will lose his daughter. Santosh is a farmer from a village in Basavakalyan in Karnataka. It has been months since Santosh tended to the crops on his field. 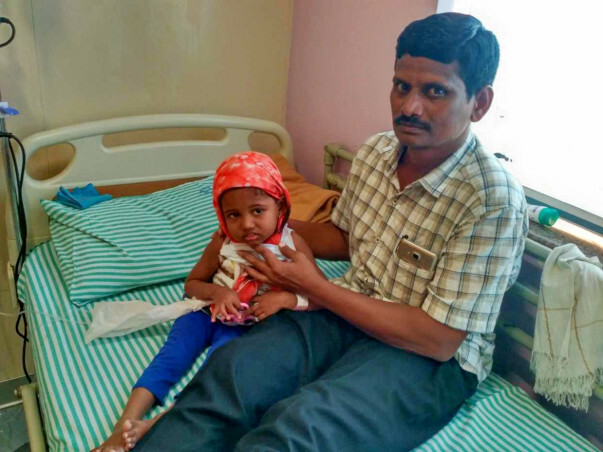 He has been in Bangalore living in a rented room close to a hospital, caring single-handedly for his 3-year-old daughter Sanvi, who is fighting a severe form of cancer. 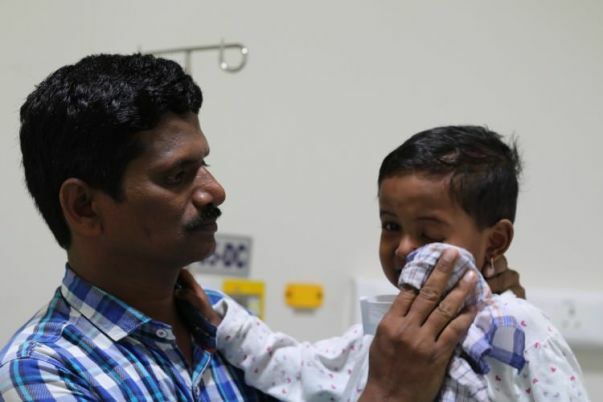 Santhosh needs our help to raise money for Sanvi's treatment. Your contribution can help Sanvi get the treatment she deserves. Sanvi is doing good at home. She is continuing the maintenance treatment. We shall keep you posted on her progress. Sanvi is doing well and is discharged from the hospital. She is recovering and responding well to the treatment. She is advised to come for regular check up to the hospital. I am rejoiced with the love and support showered on my daughter Sanvi. She is presently at home and is under medication. Her first cycle of chemotherapy was completed and she will be admitted for the next cycle by this week. Her treatment will continue for almost another 20 months. Also, there has been no side effects yet and she is doing well. We couldn't have done through such a difficult phase of life without your help. Thank you all! I'm praying God for the child to recover soon and live long life with health&wealth. He is a Great father who is take caring his daughter single-handed, hat's off to him. My Prayers to him and his entire family to give them strength in this difficult moment.